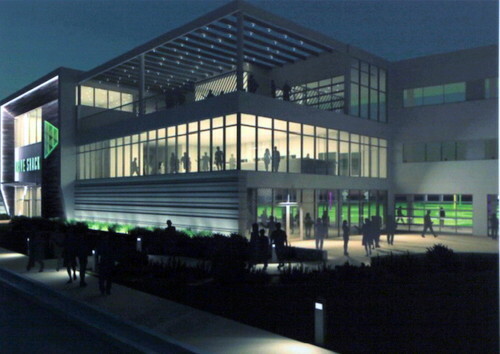 A rendering of the Drive Shack golf facility under consideration at the former Times-Picayune site at Howard Avenue. The Drive Shack golf facility under consideration for the former Times-Picayune site on Howard Avenue would require tearing down the old newspaper building completely, but the owners of the property say they are committed to preserving the massive murals inside. The Drive Shack parent company operates 80 golf courses across the United States, but the new Drive Shack entertainment centers represent an effort to make the sport more accessible — no country club memberships are needed, and anyone can show up and start to play the game. Technology in the facility will allow both new and experienced golfers to document and improve their shots. The facility in New Orleans would consist of a three-story building with a 20,000 square-foot footprint along South Broad Street under the overpass, with a large outdoor driving area behind it between Howard Avenue and Euphrosine streets, according to a site plan for the project. The building will include conference spaces for events, and food and drinks will be available at any location in the facility. A rendering of the outdoor golf area at the proposed Drive Shack. The project would need a special kind of zoning called a “planned development district,” so the developers held a neighborhood meeting Wednesday evening as a first step in that process. Zoning is only one aspect of the complex negotiations needed to create the facility in New Orleans, so the project is still only in an exploratory stage, not yet confirmed, said Michael Sherman, a local attorney representing Drive Shack in the zoning process. The entirety of the Times-Picayune building will be demolished to make room for the new facility, developers said. The building has environmental issues, but the former newspaper building’s mix of office space for journalists and executives and industrial space for printing is not readily adaptable to reuse, said Peter Aamodt of MCC Real Estate, which owns the building. That said, the owners did try to find tenants for the existing building for about a year and a half — 90 percent of their projects are historic renovations, Aamodt said. But financially and logistically, the building does not work well as a warehouse, and the owners felt the city has a substantial housing stock already. When the Times-Picayune sold the building, they did not include any discussions of the significance of the murals inside, Aamodt said, and it wasn’t until the community began questioning their fate that the new owners began researching them. They are now seeking bids to remove the murals, preserve and store them. They are also having the work appraised to determine its value before deciding on whether to sell or donate it, or display themselves somewhere, Aamodt said. Wednesday’s meeting was attended by a handful of representatives of other nearby businesses, Mossy Motors and Comeaux Furniture, who were primarily interested in the infrastructure issues, as well as Erin Holmes from the Preservation Resource Center, who asked about the decision to demolish the 48-year-old building. The site plan includes 265 on-site parking spaces, and developers will change the impermeable surfaces that cover the site currently to modern standards, retaining the first inch-and-a-half of stormwater on site and thus reducing street flooding during storms, said Miles Granderson, also of Sherman Strategies. They are also in discussions with the city to improve the area of Broad Street under the overpass to make the site more accessible and attractive. “One of the improvements for the community that’s pretty important to us is that the Broad Street overpass gets paved and striped for public access, and that the whole area gets the love and attention it deserves,” Sherman said. When the owners bought the building, they did not have any initial plan whether to tear it down or reuse it, Sherman reiterated. Oh dear. Were those murals reviewed by the city’s art review committee? I’ve never been to a golf facility, but do glass walls and golf balls really go together? They should keep the Times Picayune tower that currently stands on the property. I’m sure they could integrate it into their architectural designs. That would keep at least some historical heritage alive.